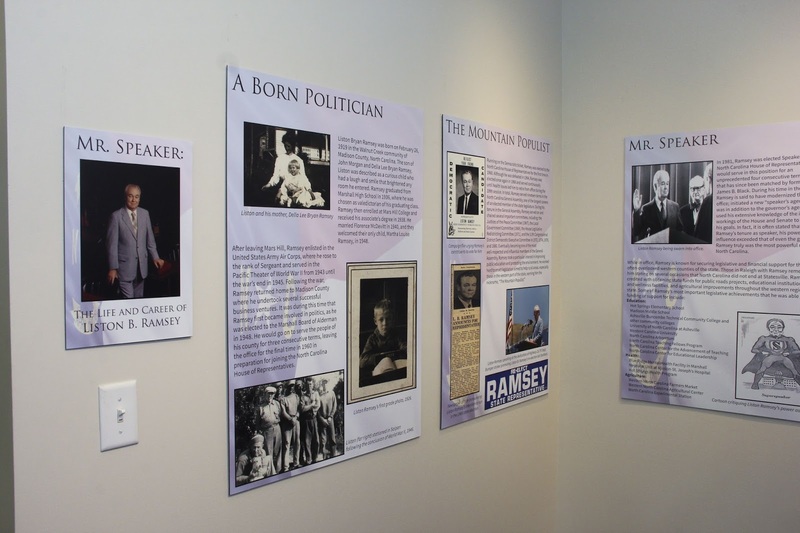 A new exhibit in the Liston B. Ramsey Center for Regional Studies honors the center's namesake. The exhibit is called "Mr. Speaker: The Life and Career of Liston B. Ramsey." Ramsey was a native of Madison County and a longtime member of the North Carolina legislature, including several terms as speaker of the state house of representatives. The exhibit contains papers and other artifacts which were donated to Mars Hill University in the early 2000s. "The impact Mr. Ramsey had, not only on Mars Hill's campus but also throughout western North Carolina, is unprecedented," said Patrick Cash, Southern Appalachian Archives Associate and Public History Program Coordinator for the university. "It is easy to believe that this region might look completely different if Mr. Ramsey had not risen to the office he had during his time in the North Carolina General Assembly." The exhibit will remain on permanent display in the Ramsey Center, located on the main level of Renfro Library on the Mars Hill campus. Summer hours are Monday-Friday from 1 to 4 p.m.; and by appointment. For more information, contact Patrick Cash at (828) 689-1581 or pcash@mhu.edu. The Liston B. Ramsey Center for Regional Studies at Mars Hill University connects the campus with the wider community to explore the history, culture, and environment of the Southern Appalachian region. The Ramsey Center preserves and provides access to resources for this study through its Southern Appalachian Archives. The Center shares Mars Hill University's commitment to local and global engagement, to service, and to experiential learning.